I love watching the first 7 minutes of “2001, a Space Odyssey,” especially at 5:27 where the ape-man suddenly has an idea, one of the greatest in history: use of a femur as a weapon. The music with the scene is perfect, capturing the full joy of the meaning. Let’s fast forward 50,000 years to a new continent and speech: “You don’t have a hitch. That attachment is an ornament. You hook a trailer to that, and your bumper is going to fall off.” That is how we first heard Ms. D. in action, and U-Haul ought to pay her a lot, for she knows a lot more than how to run a cash register. The next customer wanted to drop a truck off in the Portland area; after naming about a dozen places and directions to each, this wonderful lady said, “Oh, just call this number when you arrive. They’ll tell you where to take it.” She laughed. We did, too. When it was our turn, Ms. D. told us, “I once had a guy come in here and order $500 worth of packing supplies. When we took it out to his vehicle, he was driving a Mini Cooper. Not just any Mini, the smallest. What was he thinking?” She shook her head, and we laughed again. She didn’t know that her business had solved a problem that had kept my wife awake nights thinking about it. We were like the ape-man sitting among a pile of bones, trying to find something to eat. We were moving to a two story house in Eugene, deathly worried what our many cats, all used to one story, would do with the low railing on the second floor well above the ground floor. Many think cats always land on their feet (they don’t) or can fall from large heights without injury (also not true). My wife had looked at 176 different cat barriers online. She was worried. Neither of us dreamed the solution would lie with U-Haul and two chance occurrences. The first was when I had recently used a U-Haul trailer to bring my clothes from Tucson in two wardrobe containers. I emptied the containers in the garage and left them there, intact, because I was too lazy to break them down. Alone, they stood, waiting….The Sun was just peeking over the monolith and the music started. I looked at a piece of cardboard from another container in my hand. The ape picked up a femur. I thought of the 3 x 3 foot gap in the railing, with posts between which a cat could squeeze. 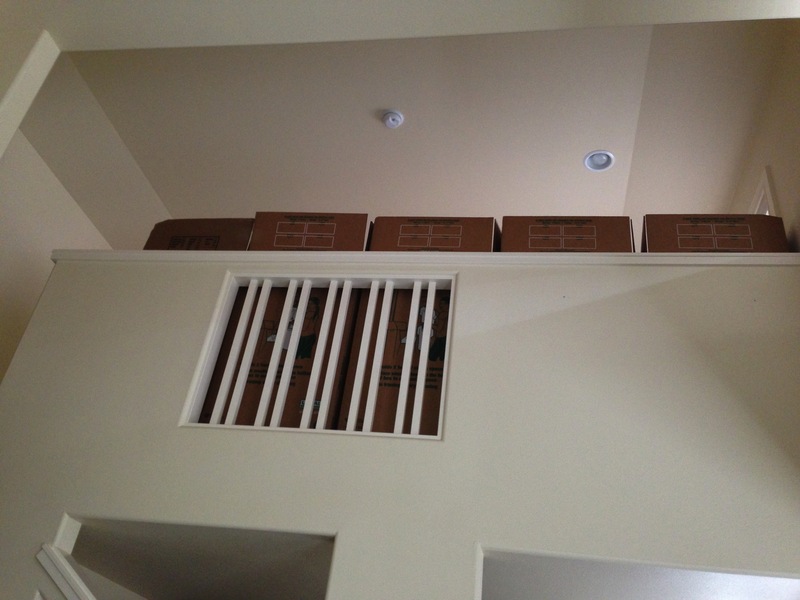 I brought the cardboard in, placed it over the gap, and called downstairs to my wife, asking her what she thought of cardboard blocking part of the gaps. She liked it. The ape starting to break the small bones. Fortunately, my wife, like me, is open to ideas. She remembered the wardrobe containers in the garage, each 2 feet square on the bottom, and if opened up, stood about 5 feet tall. Six of these containers, taped together, would offer a barrier, that while not necessarily impregnable to felines (little is), would at least slow down chases through the upstairs ending up in a long free fall on to an unforgiving carpet. The ape starts breaking bigger bones, then, arm high overhead, at the climax of the music, smashes the skull to smithereens. Our solution wasn’t with companies selling metal or cloth barriers. It was with U-Haul and Ms. D. We had a Camry, not a Mini, and our purchase was only $30, not $500. 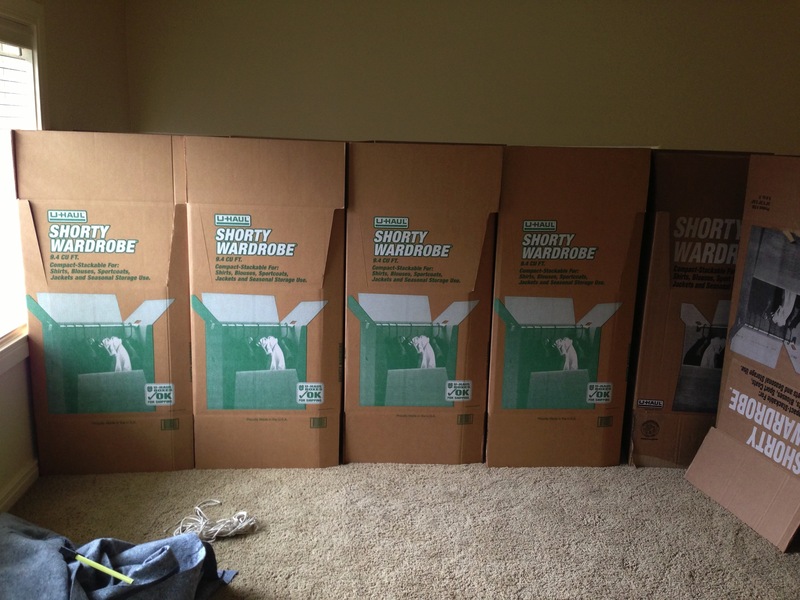 We had no problem fitting the boxes in the car, took it back to the house, and constructed a barrier. Our idea wasn’t saving humanity from starvation, but how often have you had an idea just hit you perfectly at the right time? Look at the expression on the ape-man’s face at 6:28 and 6:45: pure joy at having thought up something innovative. We were thrilled. The solution lay with a company that never once appeared on our radar. They had seen femurs for their whole lives and never thought once about using one as a weapon. A half century ago, my father and I were moving a boat hoist into the lake, for the summer. We pushed and pushed and nothing happened. Thirty yards away was a woodpile. I walked over, got six logs, and we put them under the boat hoist. The first time we pushed, it went twenty feet with minimal effort. My father laughed. I was like the ape-man, arms in the air. I had thought of something my father hadn’t. The people whom I respect are those who suggest alternatives, using phrases like “you could consider,” “have you thought about?” “what if you did this?” “here is another thought”. All of these open the door to thinking, idea generation, femurs, ending with a good solution. I never thought I would write about Mrs. D.; I smile thinking about her. We need a lot more of this at the national level. Maybe we need to think more like ape-men, rather than not thinking at all. We need to sit in a pile of bones, sit there, think, muse, then play with them and see what happens. It requires open thinking, willingness to make mistakes, and to look for workable solutions. The America I grew up in once did that. An ape-man once did that. U-Haul in Springfield is one of those places. A Congress full of Mrs. D.s would be a fun place. Better for the country, too. We all sit in a pile of bones sometimes. Maybe we should quit complaining about the lack of meat and see what good might be right in front us. 5% of the cost. Twice as effective. View from below: the gaps were the original area covered. the initial breaking of the small bones. This entry was posted on February 28, 2014 at 12:38 and is filed under GENERAL STUFF, MY WRITING. You can follow any responses to this entry through the RSS 2.0 feed. You can leave a response, or trackback from your own site.